Different rituals were needed, depending on the manner of your death. These rituals were to divine the cause of your death then to summons you to deal with the problem that caused your demise. This involves bringing your spirit back from the underworld and sending you on your way to afterlife with the ancestors who lived among the stars in the night sky. The transport horse ritual deals with one aspect of this scenario and that is getting your spirit from the ritual place to which you have been summons to the afterlife in the stars. This ascension of the deceased requires a vehicle to get them from here to there and in this case it is called the transport horse. There are obstacles between the earth and the sky that could toss you back into the underworld, you need all the help you can muster and your best bet is to have a good strong horse to ride. The ritual includes a recitation of your genealogy placing you in a lineage from your ancient forebearers establishing your position in the ranks of the ancestors and the proper burial procedures to assure your successful transition. The dead are compared to a broken egg shell or a chipped turquoise, things that you are unable to make whole again. The passage to the otherworld is dependent on your transport horse who must ford the waters of the dead and must know the right place to cross the river which is marked by a rainbow in the sky. In other ritual contexts the deer and the yak can serve as transport animals. Funerary rituals were performed as part of the preparation of the corpse and construction of a tomb. If death was premature or violent, if you were poisoned, or died in warfare, or in a fire, or were drowned, or died accidentally; these can result in your being cast into the underworld, pulled down by demonic forces which must then be propitiated to facilitate your rescue and reinstatement in the afterlife. It appears that in the eschatology of the ancients the dead are immediately set upon by a variety of demons associated with death who then attempt to pull you down into the underworld. Upon death your spirit, which consists of several distinct parts, must be reconditioned and convinced as to its death. This involved retrieval of the deceased from the underworld with required ransom offerings Then there is an evocation, calling forth the dead so that the soul can be placed in a special receptacle like a standing stone or mirror. The ritualist has to prepare a tabernacle for the deceased, a receptacle to attract and hold the consciousness of the departed so they can recover from the traumas of the underworld in a safe and protected environment outside the domain of the demonic forces that would pull you back downward. With proper ritual protection the soul is protected by spiritual forces inherent in the region which are apotropaic, having the power to avert evil influences. During this time the soul can be provided the necessary assistance with a spirit animal which will help it make the final journey. The ritualist prepares the transport animals and gets you ready to move on to the celestial realm. The remaining rituals were conducted to send the spirit on its way upward. These could include divination, prognostication, diagnosis, and even therapeutic advise, which can send the dead on their way. The funerary ritual served many functions, first protecting the living from the malefic forces that caused the death of their kin then from certain negative demonic uranic beings that require propitiation followed by genealogical recounting of the dead. Then the ritualist must assure that the dead recognizes they are dead and prepares them to move on with the help of a transport animal. These transport animals act as a surrogate to help the deceased as they traverse the postmortem terrain. The horses are outfitted with the proper ritual equipment to assure they reach the celestial empyrean. They can then deliver the soul across a river and through a pass to find a rainbow that marks the entrance to the stellar realm of the ancestors. Much of the ritual activity involves a pantheon of funerary deities, these elemental representatives include warrior gods, mountain gods and territorial gods. All these beings need offerings if you want them to intervene on your behalf. The ritual enactment involves invocation, appeasement and exploitation with offering such as barley flour, incense, vermillion and butter. The offering are transformed into smoke which was the preferred food of the gods or the means by which gods could be ransomed to provide their services to make sure the funerary transport animal made a safe passage. The transport animals act as a guide and propector to help the deceased as they traverse the postmortem terrain. The horses are outfitted with the proper ritual equipment to assure they reach the celestial empyrean. Maircea Eliade in his book Shamanism: Archaic Techniques of Ecstasy indicates that the horse is, “Pre-eminently the funerary animal and psychopomp, the “horse” is employed by the shaman, in various contexts, as a means of achieving ecstasy, that is, the “coming out of oneself” that makes the mystical journey possible. ..The dominant aspect of the mythology of the horse is not infernal but funerary; the horse is a mythical image of death and hence is incorporated into the ideologies and techniques of the break-through in plane,” the passage from this world to other worlds.” (P 467) He reported some archaic tribes that, “carve horsemen on wooden tablets which they place by graves…a funeral is accompanied by ritual songs announcing the deceased’s arrival in the other world on horseback.” (P 469) “Psychopomp and funerary animal, the horse facilitated trance, the ecstatic flight of the soul to forbidden regions. 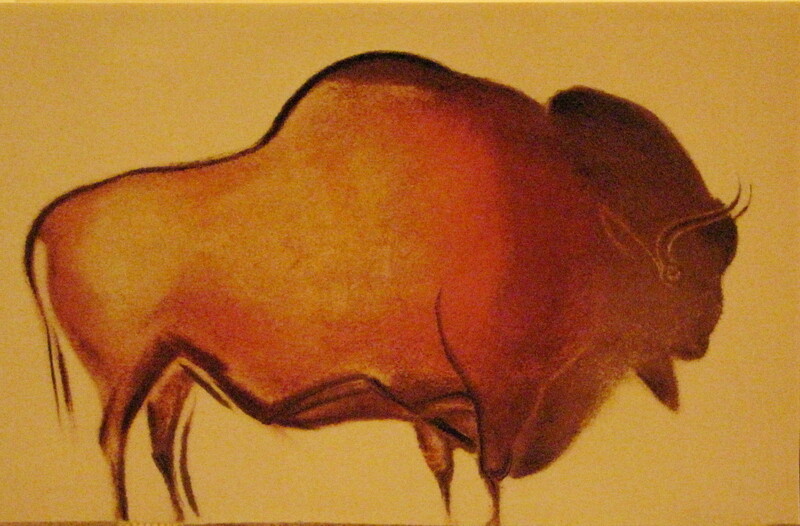 The symbolic “ride” expressed leaving the body,” (p 470) However, horses were not the only psychopomps, animal helpers can include bison, deer, sheep, ibex, gazelle, antelope and all the wild ungulates of the area which all serve equally well as psychopomps. 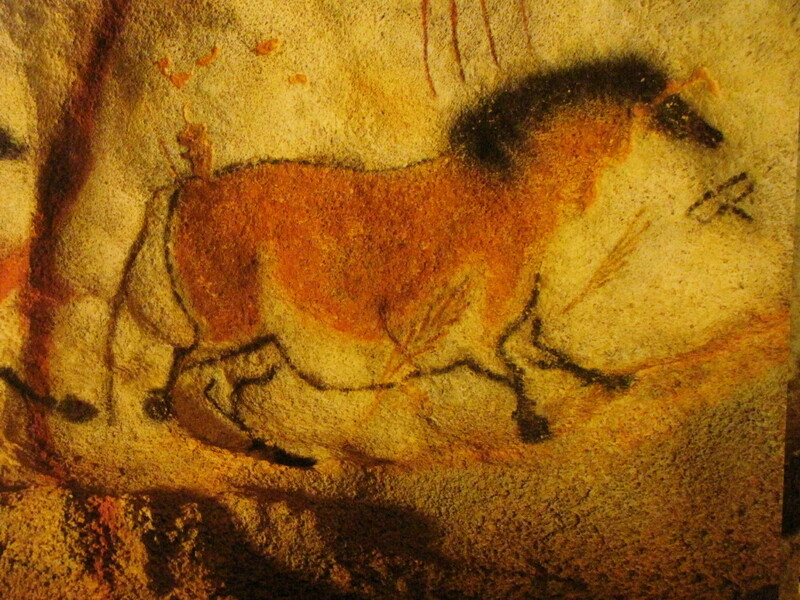 The animals found in the Paleolithic caves of France were a pictorial script found on the cave walls The horses and bison and deer painted on the cave walls could have served as envoys and guides to the other world of the ancestors. To invoke these creatures involved leaving behind the light of the sun to enter a subterranean darkness that required crawling on your stomach through a narrow tunnel to a vast cavern decorated with animals and abstract designs where the myths and legends, rituals and ceremonies, initiations and rites of passage were enacted by the beat of the drum, the song of the flute, the rattle and the bullroarer. The animals depicted on the cave walls were the animal helpers who added in these ceremonies. This entry was posted in ancient artifacts and tagged transport animals. Bookmark the permalink.